Great podcast with great resource lists on their blog. Librarians rock! I was stumbling through the Internet and landed on Bellwether Friends, a fun podcast with two librarians who also discuss pop culture. After twenty eight minutes of the various versions of Strek Trek, Bellwether friends discussed bullet journaling. Bullet journaling is an increasingly popular way of keeping a notebook that emphasizes writing in bullets instead of complete sentences and combines to-do lists, calendar planning, or whatever you want to plan out in your life. Take a listen to the podcast. Start at minute 29 if you want to skip the Star Trek material. Bullet journals are great ways to be creative about your life. This is a sample from Boho Berry. A physical journal offers a tactile experience that some people find key to retaining memories. Even though there are many ways to gather notes, images and data digitally, putting it on paper means you have to make a commitment to decide what is important. 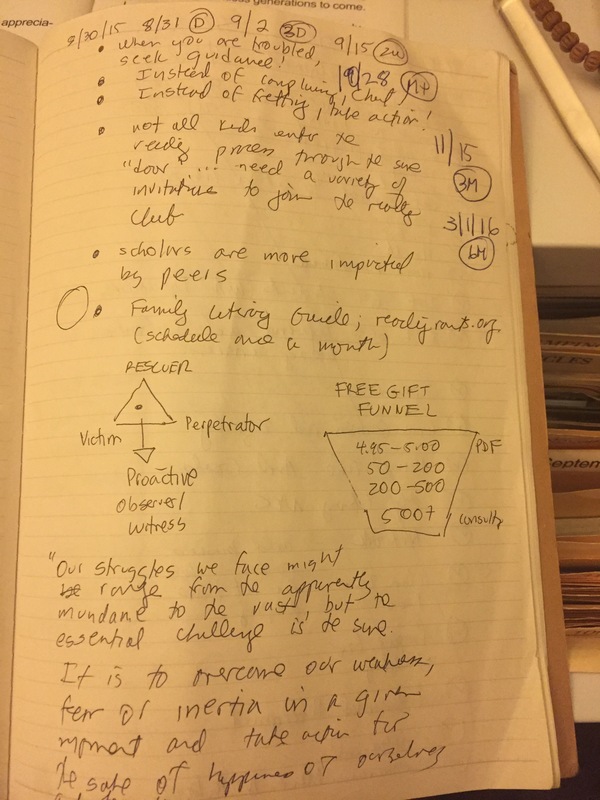 Physical journaling offers a great excuse to use paper notebooks that might have piled up in your life recently. My journal is not a bullet journal. Even though it is messy the physical act of makibg decisions of ehat to write has really helped me. If you take a look at the bullet journal articles dont be worried about how pretty everything looks. Look at the rules but forget them too. I would tell you the same thing about my Samurai Mind Notebook too. I don’t review my notebook every day but when I do it is good. Physical notebooks are some of the best way to capture your dreams, hopes, ideas and practical information. Make your own rules and get physical. Get outlaw. Put a bullet through your journal.